Resembling an electrical substation more than a place of worship, the Central Christadelphian Church at 728 Church Street is one of the earliest works of the renowned Toronto firm John B. Parkin Associates. In 1947 brothers John B. and Edmund Parkin formed a partnership with John C. Parkin (no relation), then fresh from studies under Walter Gropius at Harvard’s Graduate School of Design. Together they set out to champion the International Style in Canada and build an integrated architectural and engineering practice modeled on U.S. firms Albert Kahn Associates and Skidmore, Owings & Merrill. 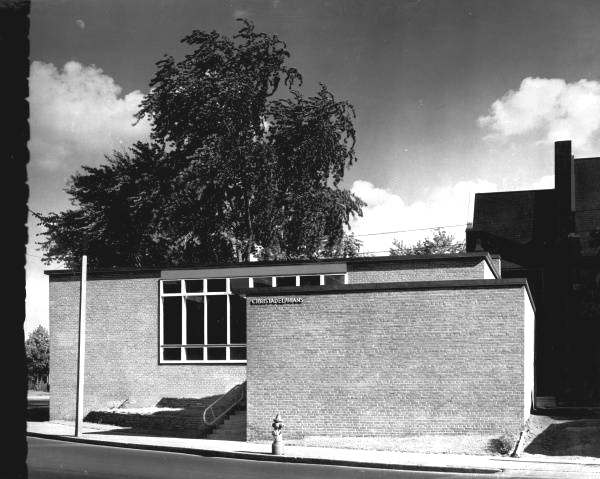 For the Christadelphian ecclesia, Parkin eschewed traditional church design to create an uncompromisingly Modernist building: two flat-roofed rectangular blocks in an overlapping L formation. This arrangement made the best use of the the small, sloping, wedge-shaped site and sheltered the entrance court inside the long curve of Church Street. Walls of red brick are flat and unadorned, save for a discreet waffle pattern on the prominent east facade, and are mostly blank for privacy. The limited glazing is concentrated on the entrance facades and elevated well above the sidewalk level. Ascending the entry steps, a surprising spaciousness is revealed at the entrance by the large areas of glass and a generous vestibule. Interiors are similarly Spartan as the exterior, with variegated ochre brick walls complemented by fixtures and furnishings of oak, birch and stainless steel. To the right of the entry was originally an open cloakroom and a library / conference room overlooking the entrance court; to the left is the main gathering space, a 200-seat auditorium aglow in natural light. Wooden folding chairs, rather than fixed pews, allowed easy conversion for other activities. Completed in 1948, the Christadelphian Church was awarded a Silver Medal in the inaugural 1950 Massey Medals for Architecture competition. The Parkin firm received five of the nine medals awarded, including the overall Gold Medal, and was clearly poised to supersede the aging and conservative Toronto architectural establishment. By 1960 John B. Parkin Associates was Canada’s largest architectural firm and one of its most progressive and influential, boasting some 200 staff members, over 1,000 completed commissions, a prestigious client list and an impressive number of honours, awards and publications in Canada and abroad. However, internal divisions eventually caused the firm to split: Edmund Parkin retired in 1964, and in 1970 both John B. and John C. Parkin left to form Parkin Architects Engineers Planners. Neish Owen Rowland Roy (NORR) emerged as the successor firm. John B. and John C. Parkin died in 1975 and 1988 respectively, but their names live on today as Parkin Architects Limited.